After finishing high school and in parallel to higher education (I’m graduated in Modern Literature), became interested and passionate about the recording techniques and sound processing. In 2005 he enrolled at the two-year course of “Technician of Sound” at the school “Spaziomusica” of Pomigliano d’Arco, following the lessons of Gigi Roefaro, Franco Cleopatra and Massimo Carola, thanks to which I build a solid theoretical basis. 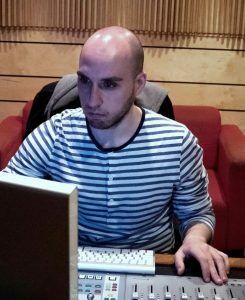 In 2007, after I graduated and having the opportunity to assist the monitor engineer John Ryan, he faces the first work experience in live concerts the world, the sector to which I still dedicate albeit sporadically. I specialize further in 2013 following, at the “Garnish School” in London, the course “Electronic Music Production” and the course “Mixing & Mastering” directed by Pete Gleadall and Al Riley. Since 2008 I started to collaborate with Ninni Pascale at the Studio Il Parco , dealing mainly the recording and sound editing work, so working with leading musicians of the Neapolitan landscape and the many artists record label “Polosud”.